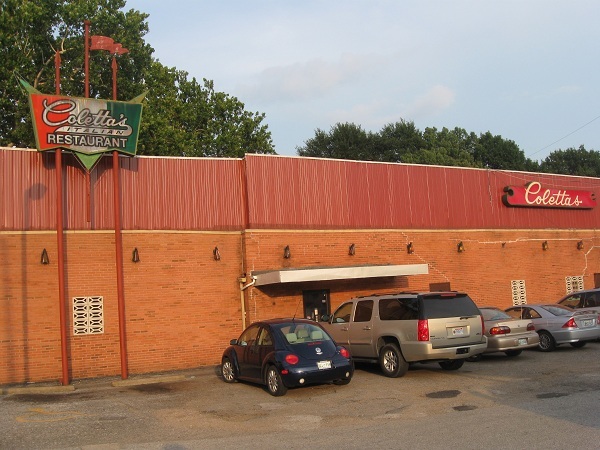 Coletta’s, Memphis TN – Marie, Let's Eat! On the Sunday we were in Memphis, I chose to wear my Zeb Dean’s T-shirt. I packed it even before we established the bizarre truth that Marie had not selected a barbecue restaurant for us to try. It’s just that I’m going to carry my home town pride with me, and even though Danielsville’s not my home town, I wasn’t about to visit a barbecue-happy city like Memphis without wearing my local colors somehow, much in the same way that I want to pack my Bulldog shirt when I’m in somebody else’s football town. I told him it was about twenty-five miles north of Athens, Georgia and he told me that if I liked barbecue, I should definitely try his. It’s called Willie Mae’s Rib Haus, and it’s in the Arkansas suburb of West Memphis. I told him that I regretted that we’d be leaving town in about two hours’ time, heading the opposite direction on I-40, because there are few things that I like better than a personal invitation to come try somebody’s barbecue. So don’t let me forget, Marie, the next time we go see your sister, we owe a fellow in Arkansas a visit for supper. As for Coletta’s, this place really is a sight. It doesn’t look like a restaurant at all, but one of those cinder-block package stores you find in my father’s anecdotes. And the food is good, make no mistake, but this is a place you need to see to get the full effect. I read about Coletta’s over at Roadfood, and it was on the short list of three places that I asked Marie to consider for one of our meals. Idiotically, however, I completely forgot to order that $1.99 homemade sausage in Italian “gravy” that I was looking forward to trying. I was so looking forward to trying the barbecue pizza that I completely forgot about it. Coletta’s claims to have concocted the barbecue pizza, and while I can’t confirm that, I’m willing to let the claim stand. 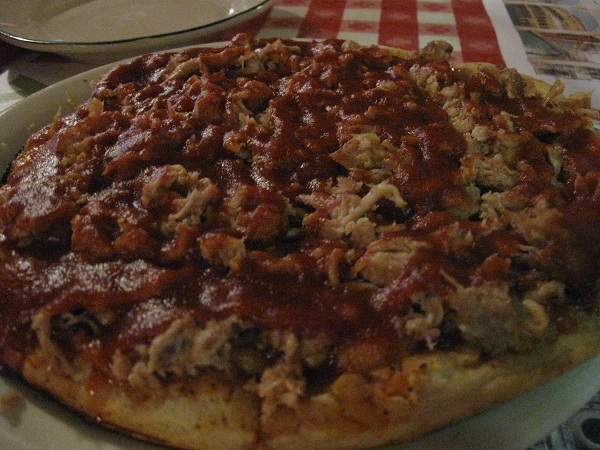 It’s chopped pork, served with cheese and a mild, sweet sauce on a thick, chewy crust. Honestly, it doesn’t compare to the pork we had at Interstate earlier in the day, but it is nevertheless incredibly interesting and I certainly enjoyed it. I don’t know that I’ve ever had anything quite like it! Marie and Anne were also pleased by their meals. Marie says that the spaghetti and sauce were tasty but not out of the ordinary, but the meatballs were exquisite. They were tender, juicy, well-spiced and big enough without being excessive. The only thing about the meal that I found disappointing were the “breadsticks,” prepacked crunchy strips that would not have been out of place next to the croutons on an inferior salad bar. Coletta’s was the last stop on our trip to Memphis. It’s absolutely a city worth another visit sometime soon, even if Marie’s sister didn’t live there. I’m sure we’ll be back before the road gets too long, and maybe catch a Redbirds game while we’re there; that is one great-looking ballpark. I’ve enjoyed reading more about the city and other things to do since returning to Atlanta. If you’re thinking about a trip that way, spend an enjoyable hour or so reading I Love Memphis, a great blog where a couple of the stops on our tour get a little more attention. Eat well, y’all! Posted on June 28, 2010 July 29, 2017 by Grant G.Posted in barbecue, italian, memphis, roadfood, tennesseeTagged barbecue, italian, memphis, roadfood.com, tennessee.